The greatest gift a shop can give quilters is inspiration…that is, start them on the road to unleashing their own creativity. It’s a gift that can’t be found in big box competitors. How, you ask? It simple and here are a few ideas. Encourage Show and Tell. Praise and applaud customers' use of fabric and color. Shine the spotlight even more by asking questions about their approach. Or how about creating a “Creative Corner” in your shop where new notions and fabrics are on display? If your customer seems to be having trouble making a decision about colors o r fabrics, suggest alternatives. Make it a store policy to send each customer on their way with at least one new idea—it’s extremely powerful and builds strong emotional ties to your shop. Fabric Warehouse of Lakeland, Fla. demonstrates this idea with their 2015 Row by Row pattern. They offer the basic pattern then give their customers additional embellishment ideas such as embroidery or applique. What a great way to encourage creativity! It’s already July and now is the time to start those holiday projects. 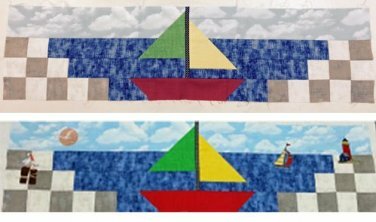 Both are fun, unique and Eazy to make--ideal for showing off any quilter's creativity.